German Language School Berlin - All levels! Start now! So you live in Berlin? And you want to learn German effectively? Try our professional and enthusiastic teachers in the number one language school in Berlin Neukölln! It doesn’t matter if you are a beginner or an advanced student, at level A1 or C1 – the deutSCHule will get you fit for your career at the university. We draw on many years of experience in all areas of German language teaching and implement them in our historic premises in the heart of Berlin. In addition to intensive German courses at levels A1, A2, B1, B2 and C1, we offer grammar courses, writing courses and challenging conversation courses with exciting excursions. Learning serious German in Berlin is a real challenge. And not all German courses are the same. But be assured: the German courses offered by the deutSCHule are unique in Berlin. You won’t just learn German; you’ll enjoy a very special language experience at the deutSCHule… Seriously! All German courses at the deutSCHule are offered at – not only for Berlin – very fair and reasonable prices. But inexpensive does not mean cheap – and you can see this for yourself during a free trial lesson (90 minutes) in one of our intensive German courses. Just come to our office before the class starts and register for your free German lesson. Because we want learning German to be an intensive and effective experience for you. 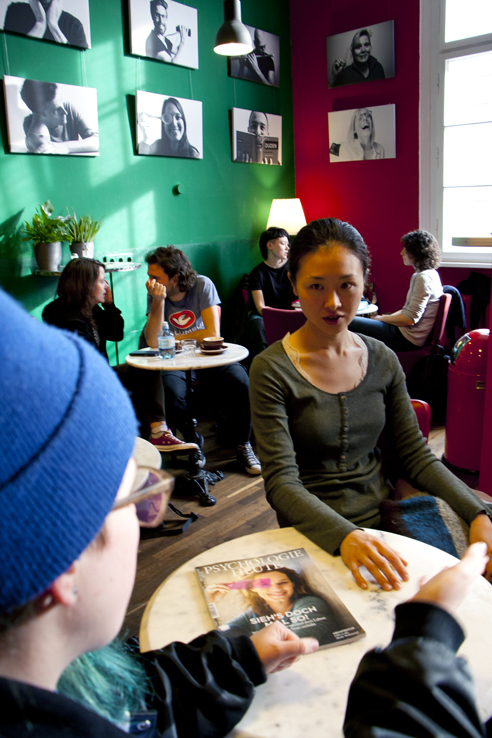 During the breaks of your German course, our in-house deutSCHule Café invites you to make friends in Berlin or simply relax with excellent coffee specialities and delicious snacks. Of course, you can use our free WiFi outside your German lessons. During the lessons, however, there is an absolute ban on mobile phones – so that you can fully concentrate on learning German. We tailor your German specifically for your studies in Berlin and Germany. In special German courses, you secure your access to college and university. In the TestDaF or the telc preparation course, you can also prepare intensively for the TestDaF and the telc C1 Hochschule or telc B2 examinations. Before you start your German course, you can also get information about your studies at the universities in Berlin and elsewhere at our office. Of course, you can also just enjoy the fantastic quality of our German courses, intensive courses and special courses. And learn to speak a vibrant and authentic German with our experienced teachers, network with interesting people from all over the world and enrich your life in Berlin with new aspects and perspectives. Your introduction to the German language is as easy as can be: just come to us in Berlin and inform yourself without obligation. We are friendly, cosmopolitan, sensitive and only a minute away from the subway station Rathaus Neukölln. We are at your disposal daily from 9:00 to 19:00.